How Bad Could It Be? Alcohol Dampens Stress Responses to Threat of Uncertain Intensity. Following neuroscience research which implicates differences in behavior, emotion, and brain response during unpredictable versus predictalbe stressors, we tested the hypothesis that alcohol would have a greater stress reducing effect during stressors of unpredictable versus predictable intensity. We administered various doses of alcohol to manipulate participants’ blood alcohol concentrations across a broad range of levels from sobriety to moderately high intoxication (approximately six standard drinks over 1 hour in a 180-pound man). We used startle potentiation and self-reported anxiety to index objective and subjective reactions to laboratory stressors (unpredictable, high, and low electric shock). As you can see in the figure, predictable high intensity stressors elicited greater negative affect than predictable low intensity stressors. This appears to confirm the old proverb, “better the devil you know than the devil you don’t know”. Alcohol’s effects on participants’ stress response were robust and linear across all stressor types with higher alcohol doses leading to lower stress responding. Alcohol’s effects on stress response were comparable across the high and low intensity stressors. 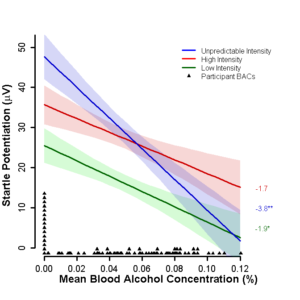 However, we demonstrated that greater alcohol stress response dampening occurs during stressors of unpredictable intensity compared to that during stressors of predictable high and low intensity. Intoxicated drinkers may be less anxious about “the devil you don’t know” than about “the devil you know,” which in turn may lead to increases in certain types of risk taking when people drink. Of note, compensatory neuroadaptation in the response to unpredictable stressors following chronic alcohol or other drug use and early chronic stress have been implicated in addiction. While most of this work has used animal models, our results represent a first step towards demonstration of the initial press for such neuroadapation in humans following acute alcohol use. Feedback, questions or accessibility issues: schneck2@wisc.edu.